Everyone loves getting recognized for their work. It's actually a critical component to employee happiness and long term engagement at an organization. If you're looking to give your recognition program a little boost, the TINYgiftcard feature might be exactly what you're looking for. TINYgiftcards are Cheers that also include a monetary reward redeemable through Tango Card. All you need to do is enable the feature, deposit money into your Rewards Bank, and give permissions to TINYpulse users to send them. Read more about usage and setup here. Belong to an organization that has enabled TINYgiftcard. Belong to a role in TINYpule Engage that allows you to send a TINYgiftcard. Contact your friendly TINYpulse administrator at your company if you're unsure about either of these items, or if you're looking for how to set permissions by role, go here. 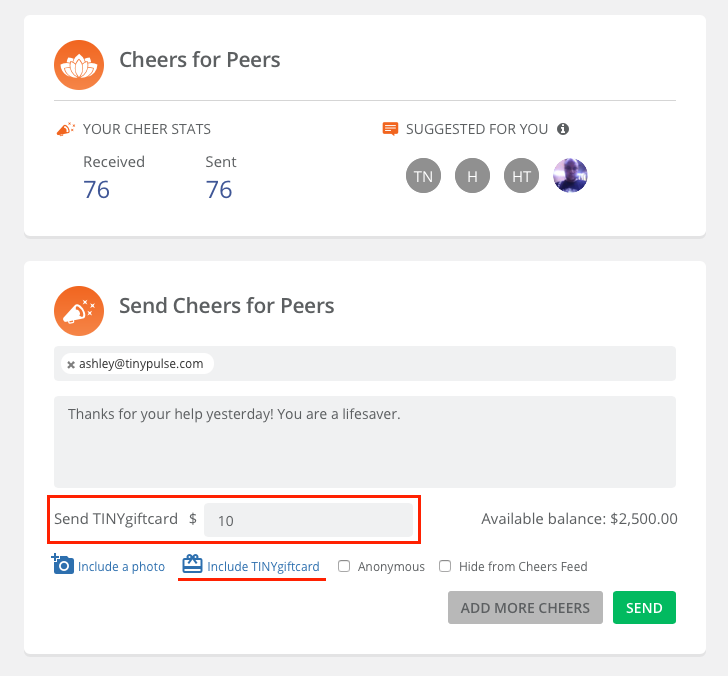 If you satisfy both of the prerequisites, you'll be able to see the Include a TINYgiftcard option when you're sending a Cheer. If you don't see it, then you don't have access so please reach out to your admin for more information. Go to the TINYpulse web app, and navigate to wherever you prefer to Send Cheers from. Enter the Cheers recipient, enter your message, and attach an optional photo as you normally would. Click Include a TINYgiftcard and enter the amount you'd like to send. Check with your administrators to see if there's a recommended or approved amount for each TINYgift at your organization. Amounts are displayed and sent in the currency selected by your admin. If your company is multi-national, you may be able to select the currency of the TINYgiftcard. Click the dropdown menu if it's available to adjust the currency (this first needs to be enabled by admins). The recipient will now get an email to notify them of the Cheer and a separate email with information about how to redeem their TINYgiftcard on the Tango Card website. A full list of Tango Card merchants can be viewed in the Tango Card Reward Catalog. Please note that all TINYgiftcards which are sent, are final. TINYgiftcards sent in error cannot be canceled or revoked except in extreme cases. If you feel as though you fall into this category, you may reach out to us and we'll work with TangoCard to see if there is any possibility of canceling the card. But neither TINYpulse nor TangoCard guarantee that funds can be returned to your rewards bank so send with caution!